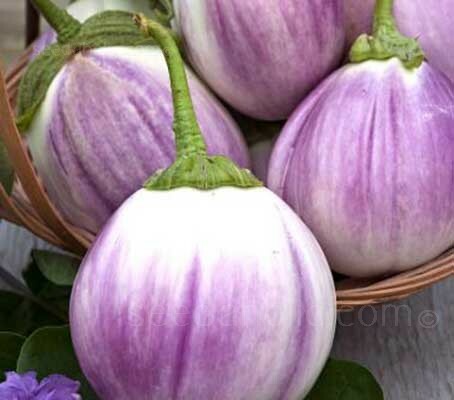 Aubergine 'Rosa Bianca' is an Italian heirloom cultivar which has become popular with heirloom vegetable enthusiasts and chefs alike due to their interesting coloration, mild flavour and creamy flesh. Considered one of the best by gourmets and gardeners alike, Aubergine 'Rosa Bianca' is a gorgeous variety with a delicate, mild flavour, creamy consistency. This colourful and attractive variety produces attractive rosy-lavender to creamy-white spherical shaped fruit 10 to 15cm (4 to 6in) in diameter. The plants grow to around 60 to 90cm (24 to 36in) in height and a spread of 45cm (18in). The fruits have a meaty flesh and a delicate flavour. They are produced in abundance and have little bitterness and few seeds. They are both lovely to look at and lovely to eat. For best eating quality, pick the fruits when they are still slightly immature, the few seeds within should still be light in colour and soft. This variety has little in the way of bitterness and because of this is extremely versatile and suitable for baking, frying, roasting, grilling as well as adding to stir-fries, curries, casseroles and stews. Aubergine 'Rosa Bianca' is a favourite for cooking Eggplant Parmisiana. Whilst Aubergine is a Tender Perennial, it is cultivated as an Annual. Seeds are typically started eight to ten weeks prior to the anticipated frost-free date. Soaking the seeds overnight may help germination. Place in a propagator or warm place, and keep at a constant temperature of 20 to 25°C (68-77°F). Keep the surface of the compost moist but not waterlogged; germination will take between 8 to 21 days Transplant seedlings carefully while quite small into 15cm (5in) pots and grow on at 18-21°C (65-70°F). Acclimatise plants to outdoor conditions for 10 to 15 days. Plant out into sheltered site when all risk of frost has passed and the soil is warm. Plant 45cm (18in) apart in rows 90 to 120cm (3 to 4ft) apart. Aubergines grow well outside, but need gradual acclimatising to the more varied conditions. A brilliant tip for this: enclose a block of plants, spaced about 60cm (2ft) apart in each direction, within a box of straw bales. These provide a brilliantly cheap but effective windbreak. If a cold night is forecast, simply drape fleece over the bales and anchor it with bricks. Grow as above, but transplant into in 20cm (8in) pots or growing bags. Stake as you would for tomatoes. Provide plenty of water, especially in dry weather. Black plastic mulch is helps to warm the soil, prevent weeds and conserve moisture. Feed every 14 days with high potash (tomato) fertiliser once the first fruits have set. Cease feeding when fruits are fully formed. Mist the foliage regularly with tepid water to discourage red spider mite and to help flower set. The flowers are relatively unattractive to bees and the first blossoms often do not set fruit. Hand pollination will improve the set of the first blossoms. Tap flowers daily to assist pollination. Remove the main tip/growing point when plants are 30cm (12in) high. First harvests can be made from the early sowings from July onwards. Harvest at their desired size, but while fruits are still shiny and young. Fruits are typically cut from the vine just above the calyx owing to the semi-woody stems. Pick regularly or plants will need further support to support the weight of the fruit. Freezing is the best method for home preservation. Harvest before seeds become mature and when colour is uniformly dark. Although we think of aubergines as being a vegetable they are technically a fruit. This is because the aubergine we eat is the ripened ovary of the flower. Other fruits disguised as vegetables include the tomato, peppers, courgette and closely related to the courgette, the cucumber, pumpkin and squash. Outdoors: Plant 45cm (18in) apart in rows 90 to 120cm (3 to 4ft) apart. Greenhouse: Transplant into in 20cm (8in) pots or growing bags. Harvest at their desired size, but while fruits are still shiny and young.